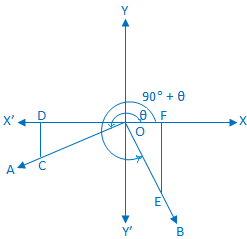 What is the relation among all the trigonometrical ratios of (90° + θ)? 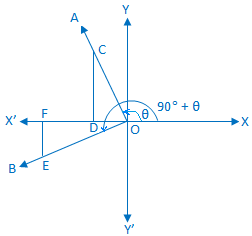 In trigonometrical ratios of angles (90° + θ) we will find the relation between all six trigonometrical ratios. 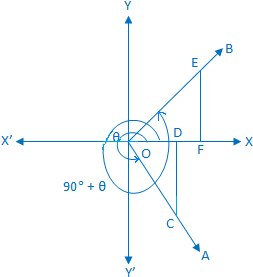 Let a rotating line OA rotates about O in the anti-clockwise direction, from initial position to ending position makes an angle ∠XOA = θ again the same rotating line rotates in the same direction and makes an angle ∠AOB =90°. Therefore we see that, ∠XOB = 90° + θ. Take a point C on OA and draw CD perpendicular to OX or OX’. 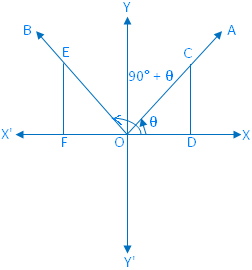 Therefore, ∆ OCD ≅ ∆ OEF (congruent). We observe that in diagram 1 and 4 OF and DC are opposite signs and FE, OD are either both positive. Again we observe that in diagram 2 and 3 OF and DC are opposite signs and FE, OD are both negative. cos (90° + θ) = - sin θ.
tan (90° + θ) = - cot θ.
csc (90° + θ) = sec θ.
sec (90° + θ) = - csc θ.
cot (90° + θ) = - tan θ. 1. Find the value of sin 135°. 2. Find the value of tan 150°.